You've probably seen this play—or film—at least once during the holidays. The director of this version tells us why this one is not "the same old story." Kelley Ryan has acted, managed and costumed dozens of plays in her long career as an actress, but the Cascades Theatrical Company's "A Christmas Carol," will mark Ryan's directorial debut. We talked with Ryan about the iconic tale, and how CTC's production will set itself apart. Source Weekly: How do you feel about taking on such a big production in your first crack at directing? Kelley Ryan: It is a little big, yeah! (laughs) All of us had to direct for a senior project (as a theater major at Humboldt State University), but this is really the first big thing I've ever done. I have been involved with theatre here for a few years. I co-directed "Laguna Beach, Ohio" with Rich Jenkins at 2nd Street Theater last year. SW: How did the Cascades troupe decide on "A Christmas Carol?" KR: I was on the play selection committee last year. I was really passionate about seeing "A Christmas Carol" chosen, because of the beautiful message and the strong tradition. A lot of us bond together over traditions. People have certain holiday movies they look forward to again and again because it strikes a chord in their hearts. I believe "Christmas Carol" is the same way—a beautiful story about the importance of our connectivity to each other. Kelley Ryan makes her directorial debut with "A Christmas Carol," playing at Cascades Theatrical Company. SW: Is that what "Christmas Carol" is all about, connectivity? KR: People have lots of pain they can experience in their lives. It's easy to want to separate themselves to find comfort. In the end, the walls they build just isolate them inside and leave them cold. That's pretty much what happened to Scrooge. SW: Ah, but then comes the big transformation. How are you handling all the different scenes, as Scrooge is visited by spirits from his past? KR: It is challenging! It's not like what's called a unit set, where the entire play actually takes place in one setting. There are nine or 10 set pieces for each scene, and 26 different scenes in the play. There are 56 characters, and a cast of 20. So it's not only constantly-changing sets, but constantly-changing costumes. It's the cast that changes the scenery – the costumed characters are changing the sets – so there's no break in continuity. You don't stop to change, but instead everything overlaps. SW: Is the Cascades production an authentic adaptation of the original book by Charles Dickens? KR: In fact, we chose the adaptation (by Jon Jory and Marcia Dixcy Jory) because among the other ones we read, this most closely adhered to the book. A lot of it is even word for word, like it was cut and pasted from the book, rather than rewritten for the stage. The book in turn is based on direct experience. Charles Dickens was a strong advocate for social change. When he was 12, his family was sent to debtors' prison while he was sent to work in a factory to earn money. He was also very close to his sister and he hardly ever got to see her or his family. He discovered how hard it was for the common man, how few laws there were to protect people and children. That's when he became an advocate, and eventually conceived of the story. The book caused immediate social change. Warehouses started giving workers time off, and giving them turkeys. Laws were passed for protection of workers and children. 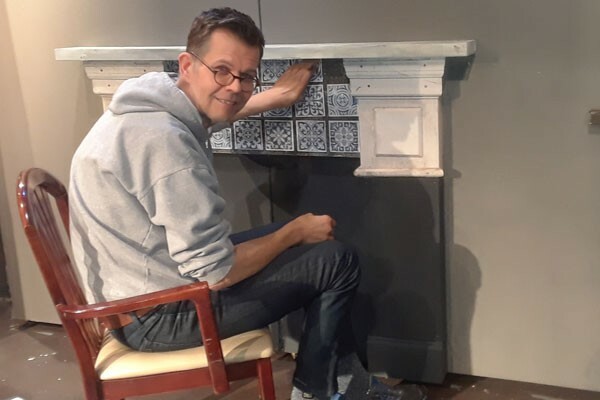 Aethetist Bill Alsdurf places tiles on the set for "A Christmas Carol," opening at the Cascades Theatre Dec 1. SW: Would you say the play is suitable for all ages? KR: Absolutely. This is something that I hope young children, families, grandparents, friends and neighbors will all come to see together, because it is such a story of friendship and love. SW: What would you say to someone who might hesitate to come and see "the same old story?" KR: I think that ticket sales alone show how the community is already excited to see it. We basically have no advertising, it's word of mouth, up until right about now, and ticket sales are extremely strong – we already have some shows that are almost sold out. By the way, if people want to get tickets, they should do it right away. I think once the word gets out, the rest will be gone in a snap.